S&S offers a truly complete 124” engine to replace the stock carbureted engines from 1999-’06 or fuel injected 1999-’05 engines. No engines are available for 2006 Dyna™ or any 2007 model. S&S T124 engines are available in silver powercoat, wrinkle black powdercoat, and polished finishes. Match the original engine in your bike or go for a custom look. Complete S&S T124 engines are designed to replace the existing Harley-Davidson® Twin Cam 88® engine in a stock chassis, making it easy to get the performance you want from your late model motorcycle. Take the stock engine out and put an S&S engine in. It’s that simple. Due to changes in S&S crankcase design, installation of an S&S T124 engine in 1999-2005 Dyna™ models requires oil line installation kit #31-0424. This kit contains a special transmission top cover and oil lines for Dyna models. For installation in 2000-’06 FLT models the stock transmission top cover may be used, but oil line installation kit #31-0425 is required. Engines with internal counter balancers are not available from S&S to replace Harley-Davidson® Twin Cam 88B™ engines. Complete engines are also not available for 2006 Dyna™ models or any 2007 or later models. For these applications we recommend S&S 124” Hot Set Up Kit®. * For installation in stock 1999-’06 Harley-Davidson® chassis only except 2006 Dyna™ models. Counter balanced version unavailable.Fuel injected engines include S&S Variable Fuel Injection (VFI) system with single bore induction and teardrop air cleaner. S&S tuned induction must be purchased separately as an accessory. Engines for 1999-’06 carbureted models come with the S&S Super G carburetor with the slotted “Desperado” air cleaner cover for good looks and improved performance. Carbureted S&S T124 engines include the S&S Intelligent Spark Technology (IST®) ignition system. In addition to the knock sensing ignition control, the IST Guardian “break in rev limit” feature protects the new engine from premature failure with a lower rev limit during break in. IST equipped engines are covered by an extended two year warranty because we are confident that the IST ignition will protect the engine from damage. Available for 1999-’06 models. te fuel injected T124 engines for 1999-’06 models come with the S&S Variable Fuel Injection (VFI) Module and S&S single bore induction system with a teardrop air cleaner. Engines can easily be upgraded to S&S single bore tuned induction with a simple bolt-on induction kit. (See Section 5 for more information) The VFI system included with each fuel injected engine, comes with closed loop sensors and the complete S&S ProTune II software package. Delphi® style systems also include knock sensors and break-in rev limiting to protect your engine from damage. Base maps for T124 engines with the most common exhaust systems are available on the software CD and from the S&S website. However, it is recommended that the VFI System be fine tuned at an S&S VFI Tuning Center. Since we have added the S&S Closed Loop Sensor Kit to all VFI equipped engines, tuning is much easier and the amount of dyno time required to fine tune the engine is greatly reduced. * Engines with S&S IST ignition may be used in 1999-’06 chassis. Includes S&S VFI module. All VFI equipped engines include single bore induction with S&S teardrop air cleaner. Tuned induction can be purchased separately as an accessory. * S&S engines are not available for 2006 fuel injected or any 2007 or later models. 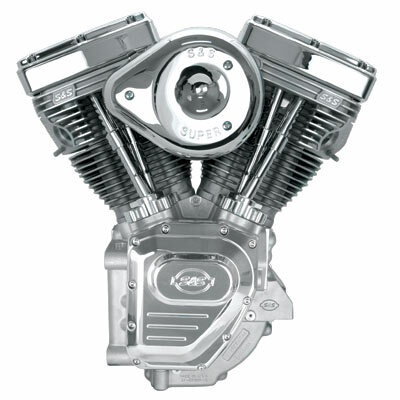 S&S V124 engines are designed to replace stock Harley-Davidson® Evolution® big twin engines in 1984-’99 chassis. This is a single cam design engine which has a similar configuration to stock, it’s just bigger and badder. The V124 engine is available for carbureted and fuel injected models, and in natural, black, and polished finish. All V124 engines now feature chrome billet tappet guides and gearcover, electric compression releases, and show quality chrome plated diecast S&S rocker covers. S&S Super G carb with a teardrop Desperado air cleaner cover and either the S&S Super Stock® ignition system or the S&S Intelligent Spark Technology (IST®) Ignition. V124 engines with the S&S Super Stock® Ignition System carry a one-year warranty. For an extra year of warranty choose an engine with the S&S IST. Engines purchased with the S&S IST ignition carry an extra year of warranty because we are confident that this ignition will prevent damage to the engine due to knock or detonation, or over revving during the break-in period. Engines with IST feature a special chrome billet gear cover and are available only with billet tappet guides. Not recommended for kick start applications. Fuel injected V124 engines for 1995-’98 models come complete with a Magneti Marelli® style S&S Variable Fuel Injection (VFI) module, single bore induction with a teardrop air cleaner, and the S&S closed loop sensor kit. Engines can easily be upgraded to S&S single bore tuned induction with a simple bolt-on induction kit. (See Section 5) The VFI system included with each fuel injected engine, comes with closed loop sensors and the complete S&S ProTune II software package. Base maps for V124 engines with the most common exhaust systems are available on the software CD and from the S&S website. However, it is recommended that the VFI System be fine tuned at an S&S VFI Tuning Center. Since we have added the S&S Closed Loop Sensor Kit to all VFI equipped engines, tuning is much easier and the amount of dyno time required to fine tune the engine is greatly reduced. Upper curves of this dyno chart show S&S VFI Tuned Induction System. Lower curves show S&S VFI Teardrop Induction System. Although these tests were performed on an S&S T124 engine, the results are identical for V124 engines. THE GRAPH SHOWS THE NEW PANHEAD STYLE MOTORS THAT ARE NOW AVAILABLE. *1948-53 APPLICATIONS REQUIRE 1954-64 TIN INNER PRIMARY COVER. AS WITH ALL OF OUR S&S MOTORS YOU NEED TO CONTACT US FOR PRICING ON THESE MOTORS. ALL SHOVELHEAD MOTORS COME ASSEMBLED WITH SUPER E CARB, S&S SUPER STOCK IGNITION, 2 YEAR WARRANTY. ALL EVO STYLE MOTORS COME ASSEMBLED WITH CARB AND IGNITION INSTALLED. SUPER STOCK IGNITION MOTORS BELOW 120″ GET A 2 YEAR WARRANTY, OVER 120″ GET A 1 YEAR WARRANTY. ALL EVO STYLE MOTORS WITH THE IST IGNITION BELOW 120″ GET A 3 YEAR WARRANTY, OVER 120″ GET A 2 YEAR WARRANTY. NEW V111 MOTORS NOW AVAILABLE AT GREAT PRICES. THESE MOTORS WILL FIT ANY EVO POWERED BIKE. THESE ARE “SQUARE” MOTORS THAT WILL GIVE YOU LESS VIBRATION AND A LONG ENGINE LIFE WHILE STILL HAVING PLENTY OF POWER. *S&S MOTORS ARE NOT AVAILABLE FOR 2006 FUEL INJECTED OR ANY 2007 OR LATER MODELS.